The Little Mermaid is in town, although it's a tad different than the 1989 film version or the 2008 Broadway version, and refreshingly so! Disney teams seem to have learned that modern mommies aren't keen on pushing the theme of searching for an enchanted prince who will rescue would-be princesses and make their dreams come true. Even their fairly recent film adaptation of the classic Hans Christian Andersen story has now been modernized even further, presenting instead a young woman who is searching for where she belongs, and a strained father - teenage daughter relationship where both wish for better communication. Sassy crab Sebastian (my favorite in the film and this stage version, played at DSM by Alan Mingo, Jr.) is still offering guidance, but not so much protection; this lady doesn't need it. Thank goodness! The set, lighting, choreography, and the colorful costumes all work together beautiful to give the effect of being under water, and I was glad to see that flying was introduced to this production after being nixed from the Broadway version in favor of roller-shoes (awkwardly). It all adds the sweetest amount of spectacle without being overwhelming. 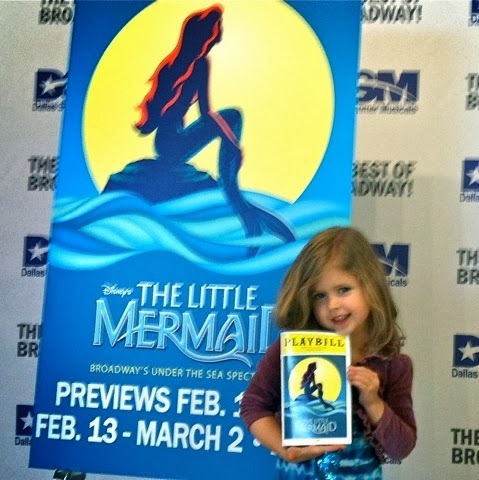 My 5-year-old Inara and I had a fun discussion after the show about how they made it all work, which can be just as exciting as the idea of mermaids swimming on stage. The music is lovely; just enough of the favorites from the film version while introducing a dozen new ones that didn't feel out of place. 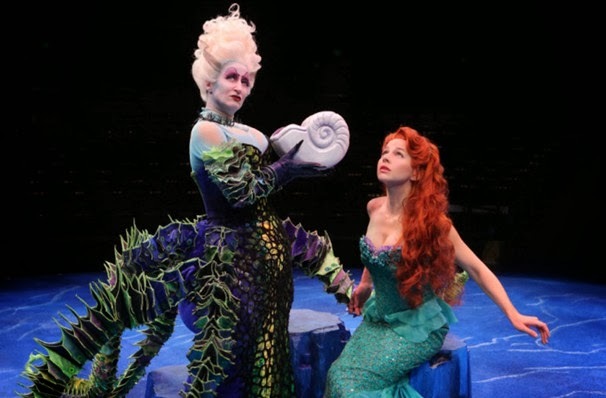 Liz McCartney was a powerhouse Ursula who is just scary enough but didn't have Inara running for the exits, and Chelsea Morgan Stock, who came from the Broadway version, is ridiculously sweet and adorable, but with the pipes of a Broadway veteran. The gentlemen of the show switch from sailors to chefs to seagulls to fish amusingly and impressively; I admit to spending a decent amount of time imagining those frantic costume changes backstage.